Fill out the form below to download full version of Fastener magazine FOR FREE. The condition of downloading the articles is filling in all personal data. 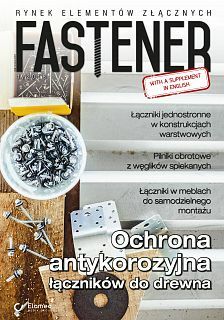 e-mail: dok@elamed.pl or editorial office: fastener@elamed.pl. I hereby agree to the processing of my personal data for the conducting of marketing activities and distribution of publications by ELAMED Sp. z o.o. Sp. K., having its registered offices in Katowice, al. Roździeńskiego 188c, in accordance with the Act dated 29 of August 1997 on Personal Data Protection (consolidated text: Journal of Laws 2002, No. 101, Item 926 as amended). At the same time, I take note of the fact that providing my personal data is voluntary and that I have the right to access my personal data, correct them and to object to their further processing. I hereby agree to the electronic receipt of commercial information from ELAMED Sp. z o.o. Sp. K., having its registered offices in Katowice, al. Roździeńskiego 188c, on the email address provided by me, in accordance with the Act on Providing Services by Electronic Means of 18 July 2002 (Journal of Laws 2002, No. 144, Item 1204). At the same time, I take note of the fact that providing my personal data is voluntary and that I have the right to access my personal data, correct them and to object to their further processing. I hereby agree to be contacted via telephone in order to be presented commercial offer, in accordance with the Telecommunication Law of 16 July 2004 (Journal of Laws 2014, Item 243).